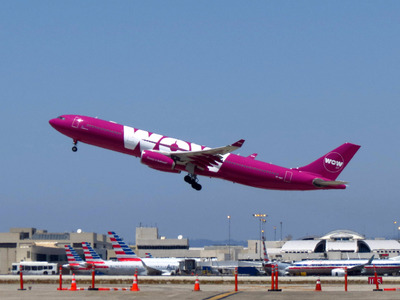 Flickr/redlegsfan21WOW Air is offering flights from the US to Europe for $US99. They include $US99 tickets from the US to Europe and $US6.63 flights within Europe. Black Friday is almost here, which means that steep discounts will be available for just about any good or service you could think of. But while clothing and electronics retailers get much of the Black Friday publicity, don’t forget about airlines, many of which will be offering tickets to some destinations at a fraction of their normal price. Here’s a round-up of some of the best deals airlines will be offering on Black Friday. Icelandic airline WOW Air will sell one-way tickets from a handful of major US cities to European cities like London, Paris, and Amsterdam for $US99 as part of its Purple Friday promotion. Europe’s Ryanair is selling European flights starting at $US6.63. The airline will continue to offer new deals each day until Nov. 26. Here’s the full list of Ryanair Black Friday deals. Delta is selling discounted roundtrip flights to Ponta Delgada, Portugal, starting at $US559 from Boston. The sale will continue until Nov. 28. Southwest Airlines is discounting flight and hotel packages by $US125 for domestic flights and $US250 for international ones until Dec. 4. Air China will allow travellers to save 15% on all round trips from the US to China from Nov. 24 to Nov. 27, according to Travel + Leisure.